The most effective productivity tool of 2016 and beyond isn’t a fancy gadget or app. You can’t buy it from Apple, Google didn’t invent it, and it won’t cost you an arm and a leg. It was actually invented in the 1800s and your local dollar store might even carry it. Any guesses? The number one most effective productivity tool to keep you organized, productive, and efficient, whether 1886 or 2016, is the steno pad. A common issue many of my clients have when I first start working with them is their task list is an assortment of sticky notes, random pieces of paper, emails, the back of mail, and notebooks. At some point they had fallen into the risky habit of writing down notes, tasks, and ideas whenever and wherever they are on anything that resembles paper. The problem is their task list winds up being scattered, disorganized, easily lost, and random which in turn makes them feel scattered, disorganized, overwhelmed, and incapable of being productive. Can you relate? It is hard to focus when your tasks are literally all over the place. You don’t need that additional chaos in your life. 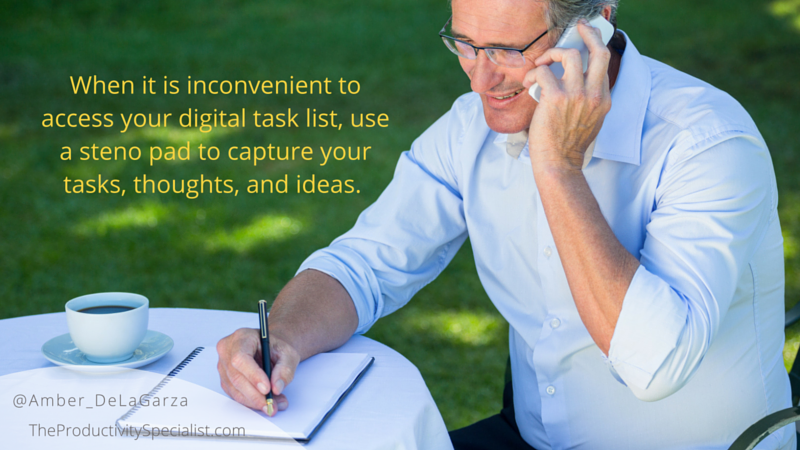 It is nearly impossible to focus and be productive if you do not work from a task list. I teach my clients the five strategies to conquer their task list and reduce the feeling of being overwhelmed. The first strategy is to keep your task list in one centralized location. The simple steno pad is that perfect location. A steno pad is the one little productivity tool you can most easily use to keep yourself organized whether on the road traveling, with a client, at a meeting, or in your office. It fits effortlessly in your purse or briefcase, is easily replaceable, and ultimately affordable. Take it with you wherever you go to keep a running list of your ideas, thoughts, and to-do’s all day. I strongly suggest keeping a digital task list for numerous reasons but opening up your task management system is not always feasible. There will be plenty of times when you’ll be speaking over the phone with a client, in a meeting, or in the middle of a project, and it will be inconvenient to access your digital task list. Use your handy steno pad instead to capture your notes. Write legibly. If you’re writing something down, it’s probably important. Make sure you’ll be able to read it later. Use shorthand. Abbreviations and symbols are your friends as long as you can remember what they mean. Using shorthand saves a great deal of time. Utilize asterisks. If a note is a task that requires action, put an asterisk by it. It will be easier to extract out these action items later. It is essential to complete a weekly review at the end of each week in which you can tie up loose ends, determine what was not completed, and properly schedule your following week. Your weekly review is the perfect time to look back through all of the notes on your steno pad. The notes may be ones you took while on the phone with a vendor, client, or prospect, jotted down during a meeting, or wrote during other times in which it would have been inconvenient to open your digital task management system. 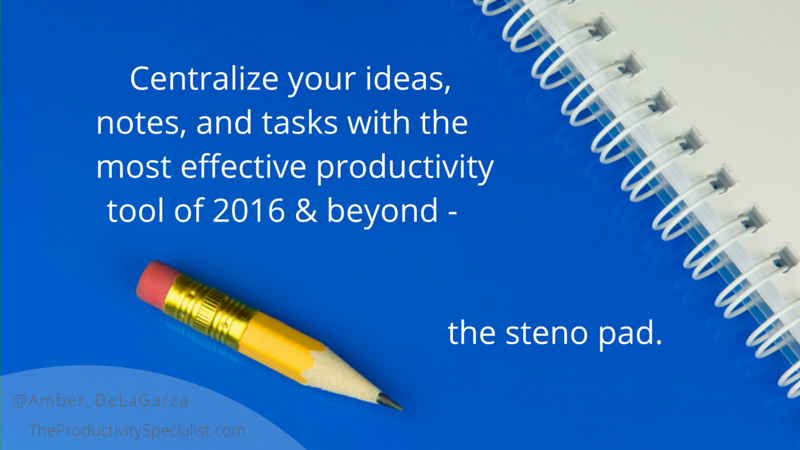 Process all of the notes in your steno pad, completing quick tasks and creating digital tasks as you go. Your steno pad should be blank once you’ve processed all of your notes for the week and ripped out the pages, enabling you to start fresh every single week. If you ever need to reference a phone number, old note, grab an action item, or find a random thought or idea, you don’t want to have to rummage through the multiple notebooks in your briefcase, sticky notes scattered across your desk, or random pieces of paper to find it. Your time is too valuable. Do yourself a favor and start using the most effective productivity tool of 2016 and beyond. The steno pad is the perfect place to keep all of your tasks and ideas in one, centralized location, making your business and life more manageable. task list in one centralized location.